With this budgeting bloggers post I get closer and closer to a year of doing this. Part of me wants to do a year round up and see how much I spent all year. The other part of me doesn’t want to see the number. Oy. The collage makes it look like I brought home less than I really did. If you can’t tell, I was kind of lazy putting it together. I also got some handmade items from two shops that I highly recommend. Both Atlanta locals, I was very impressed with what I brought home from ICE. I wish the girls behind Knit, Pray, Love had a website because their infinity scarves are between $10 and $15 more than a mass produced counterpart, but INCREDIBLY well made. So soft too and not itchy at all. Numbers 3, 4, 13, 17, and 18 and the only items I bought that “break” the rules, since they aren’t outerwear, shoes, or off my wish list. I did save my coupons and rewards though. So! How did you do this past month? There are a few outfits missing in this set. I’m really much closer to 40 different outfits from this limited set of clothes. It’s exciting to think of what I’m creating with less than half of what I normally work with. It’s getting close to time to re-work the fall capsule just a little bit. The high today in Athens is 39 degrees. Tomorrow’s high is 49 degrees. Though it’s going to warm up a little bit more through the end of the week (and we’re supposed to see 70 again this week– thanks Georgia), I think it’s time to add a few more cold weather options to the capsule. Tunics are one of my favorite options when you just don’t quite feel like wearing dress and want the comfort of leggings. It was a long day at work this day, in case you can’t tell by my lack of hair style and make up– and jewelry. Oy! OMG guys these booties. They make me so excited I forget how to talk. I’ve been wearing them ALL THE TIME. 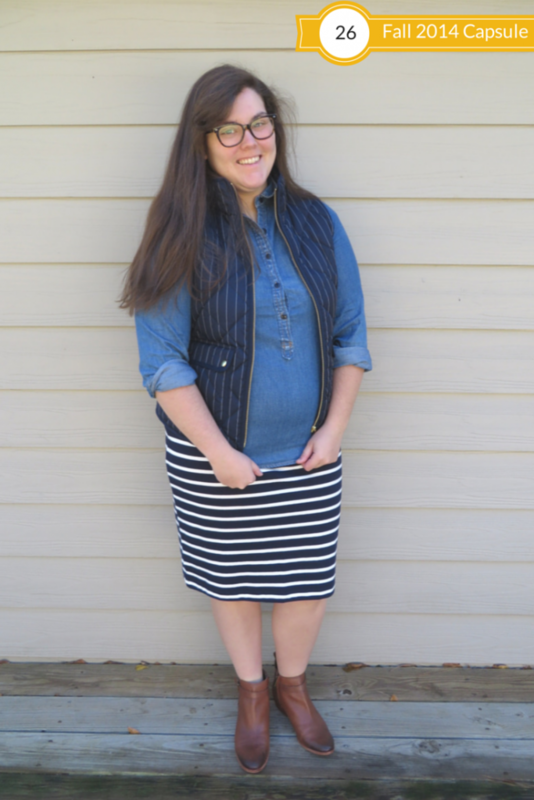 There’s one outfit between 25 and 26 where I’m also wearing them. I almost wore them out of the store that day. I can only assume that Clark’s version from this year is just as comfortable. 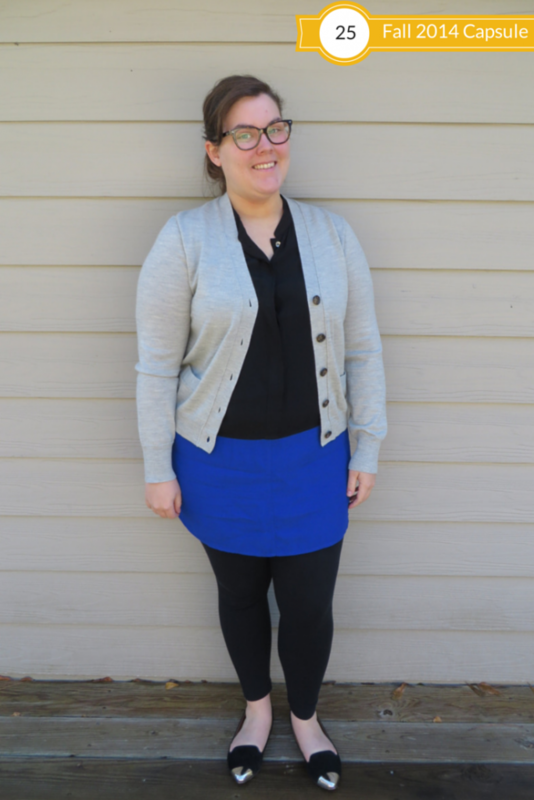 This outfit is pretty much outfit 20 with different shoes and a different color cardigan. 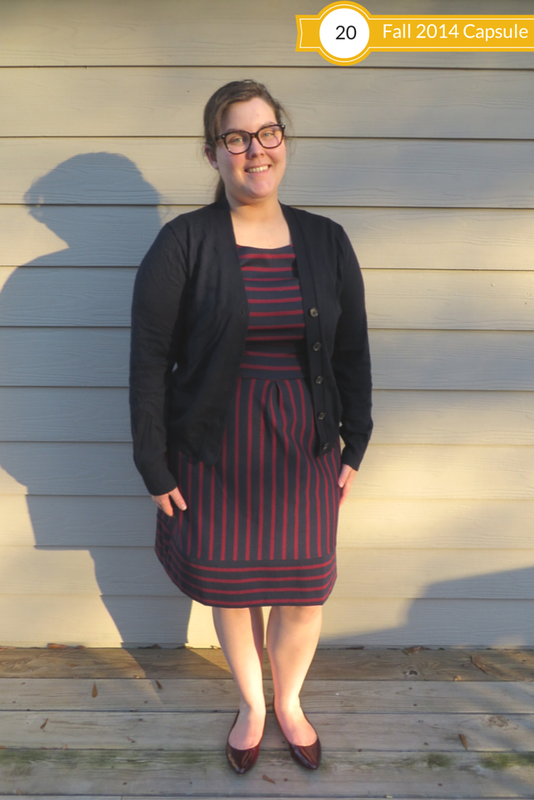 I love this dress though and am dying to figure out other ways to wear it. Any suggestions? These cardigans are easily the star players of my capsule wardrobe. I highly recommend taking a trip to your nearest Crew and scooping them up with the 40% off sale. Though I didn’t officially count them in the fall capsule, I think I will count them in the winter half in an effort to continue to simplify. I’m still not going to count heavy coats, vests, and other true outer wear items. In case you can’t tell, it got really cold there for a day. I also think this one is out of order. I think it actually goes between 31 and 32. 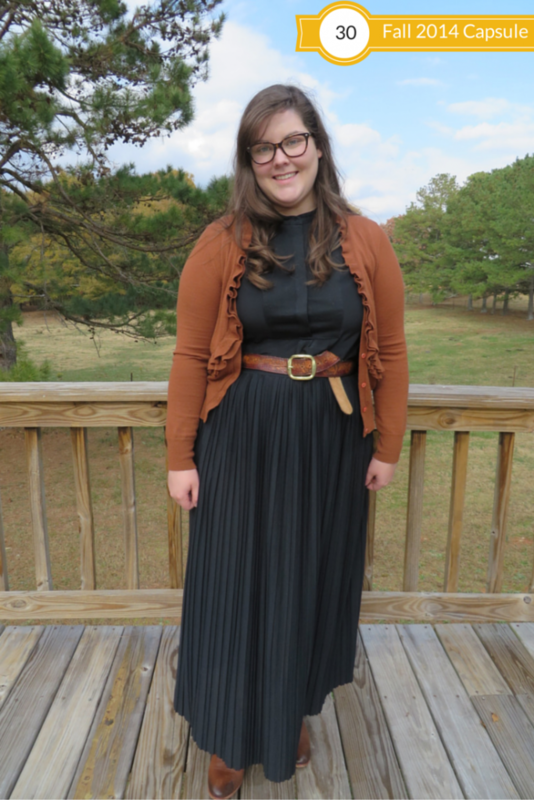 Corey kept calling me the woman in black in this outfit. I told him Johnny Cash wore ALL black. I have cognac mixed in. This may just be one of my favorites of this set though. Can you tell I LOVE these booties? Also the morning, when I took these pictures, it was almost 70 degrees. At some point during the day a cold front blew in and by the time I left for home it was 40 degrees and I was not wearing enough clothing for 40 degrees. 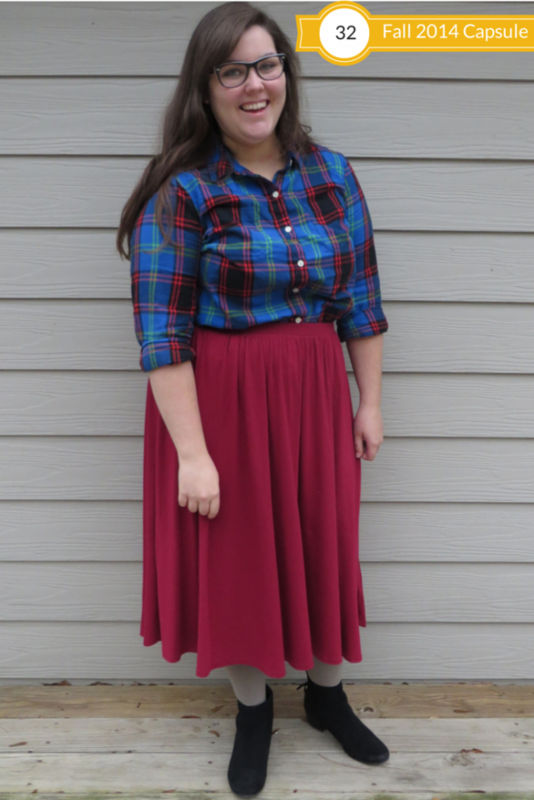 Sad to say, but this skirt is going to get swapped out for something warmer during the winter capsule. All of these pieces are staying though. I am more than thrilled with these booties too. If you’re looking for a black suede pair, check these out. I found mine at Marshalls. I noticed the pull tab for the zipper on the back is strange though. I’ll probably end up changing it. So out of this batch, which one is your favorite? What do you think should go for the winter? For you viewing pleasure, more awkwardness of the Ipsy and Birchbox unboxing. Want to get in on the fun? Check out Ipsy here and Birchbox here. 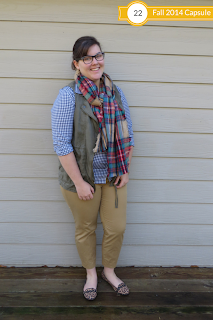 I’ve finally had a minute to sit down and write for the blog! This past month has been (from 15th-15th) has been very busy– not that I’m not busy all the time, but I’ve been working more trying to tie up loose ends before the end of this year. What I cannot believe is that this year is almost over! Reading:: From the Mixed Up Files of Mrs. Basil E. Frankweiler— yes, it’s a children’s novel, but it makes me nostalgic for New York City and the Met. I’ve been anxious to go back and visit these past few months. It’s been too long! 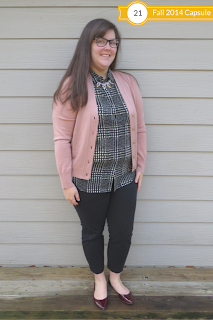 Writing:: about what I consider unexpected capsule wardrobe benefits. Among less laundry, I’ve found several more. Look for that later this week. Listening:: To Chopped. The recent Netflix update has been awesome. There are Food Network shows and HGTV shows on it now, some of my favorites too that I have missed this past year of being unplugged. Smelling:: tomatoes from dinner. We warmed up some stew. It’s perfect for this chilly weather. Wishing:: that we lived closer to town sometimes. The convenience is something I miss! Hoping:: this week flies by. And the next one, since we’re headed to Disney in 13 days! Wearing:: an oversized tee and sweatpants. It’s my Sunday uniform while I’m at home. Loving:: the chilly weather. Southern winters are super mild and our winter highs are in the 40s, but I always feel so much better health-wise the colder the weather gets. My sister is the complete opposite. Wanting:: one day to relax. Not worry about work. Not worry about the home or cooking. Hopefully one of the days off that’s coming up I’ll be able to enjoy that way. Needing:: a better cleaning schedule. For the past four weekends, we’ve had company at least one day if not both and I’m frantic trying to tidy up until they arrive, but I love enjoying a clean and tidy house all week. Feeling:: quite tired for it to only be 8:30 PM. When it gets dark so early, I can’t help but want to go to bed much earlier. What really is ‘mayo’ anyways? You’re drunk J.Crew, go home. There are plans to remove the large hat from Hollywood Studios. Why this is a good thing. Comments. The joy and the bane of a bloggers existence and why one blogger doesn’t have them anymore. Influenster is a very cool product testing company. Here are some great ways to get started. I’ve been so good about not stopping at Starbucks, and our bi-weekly budget shows the difference. I finalized my capsule a month ago and have been enjoying remixing the pieces as you can see here and here. Posting on the blog is still something I need to have a better schedule. Between work picking up through the end of the year and the blog growing a little more, I need to balance them better. Our gluten free dinner went very well! And Corey said that he enjoyed it and he’s Mr. Gluten himself. Carrying over the blog post schedule balance, especially since I took it slow the past two weeks. Empty/use five beauty products. Getting both an ipsy and Birchbox, I have samples piling up. Some of these are fabulous products and I want to completely use five of them a month. Project life some of our recent Disney trips. I’m about a year behind on these and I don’t want to miss the memories in the years to come. Read more books secularly. I used to ravenously devour books and I can name two I’ve read this year. It’s disappointing. That’s it for currently and my goals for the week. How was your week? Looking forward to anything? WOW! (again– just for emphasis) The KISS Instawave styling tool is possibly the easiest way to curl your hair, especially for someone “hair-styling challenged” like me. What about the KISS Instawave makes you want to try it? Though I did receive an this awesome KISS Instawave curling tool courtesy of Brandbacker as compensation for sharing my opinions, they for sure can’t be bought. Honesty is the best policy. I don’t know about y’all, but for some reason, stepping away from the blog for a few days makes me so ready to get back to it! Thank you all for the sweet anniversary wishes as well! You’ve seen outfits 17 and 25 in the capsule, so here’s the outfits in between. 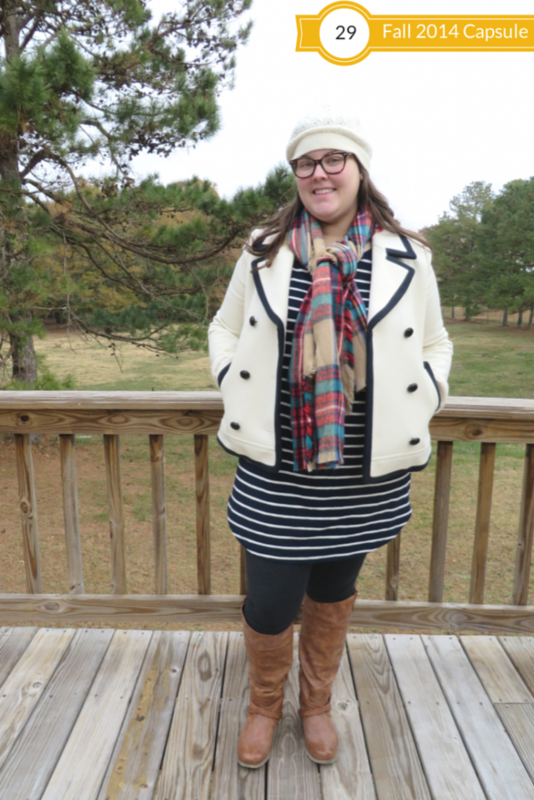 Have you entered the Blogiversary giveaway yet? 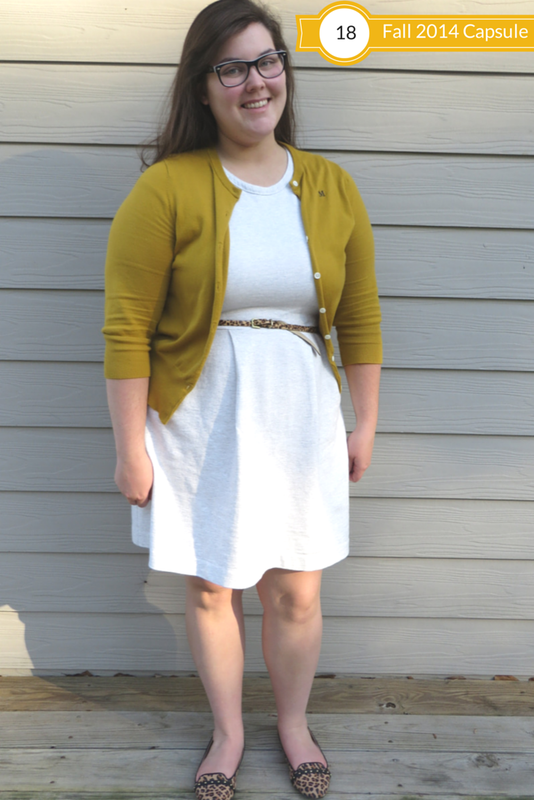 Outfit 18:: (dress::similar cardigan::similar flats) I never want to give this dress up! I’m so excited to still have it in my fall capsule. This isn’t the first time it’s been seen with leopard, but it is the first time with mustard. It was one of those unseasonably warm fall days and this worked well. Outfit 19:: (top::jeans::flats) There are times when simple is the way to go. The top has also become one of my favorites. It’s taking a lot of will power not to wear it every day. 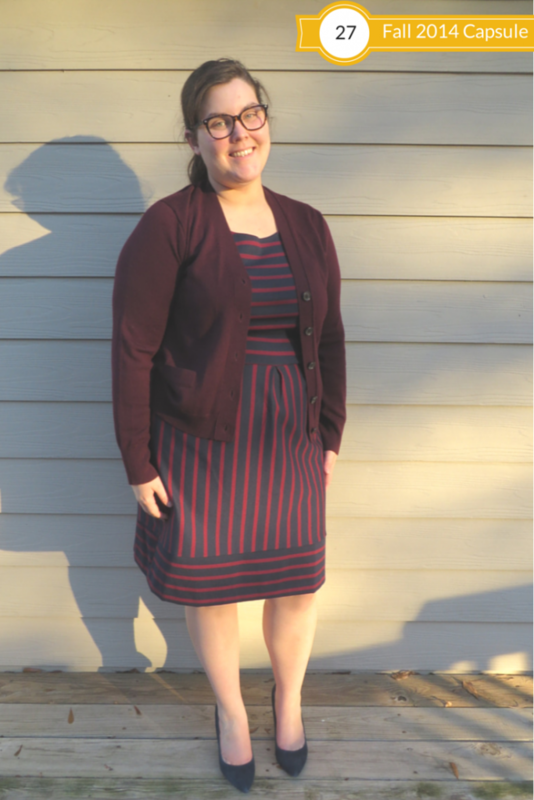 Outfit 20:: (dress::cardigan::flats) It’s easy to understand why Target brought this beauty back again this year. This dress is sublime. It fits so well. I’ve had no issues with the invisible zipper, which is rare for less expensive clothing. 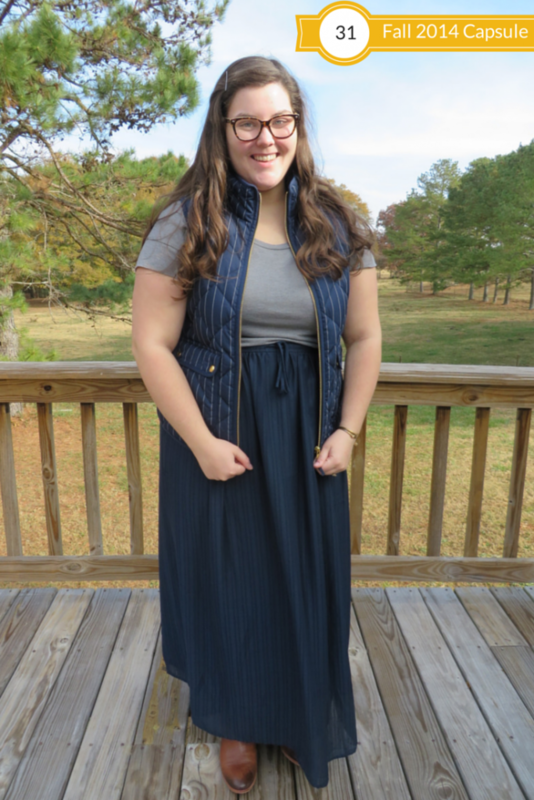 The cream of the crop is that it has pockets. This year’s is just as nice too. 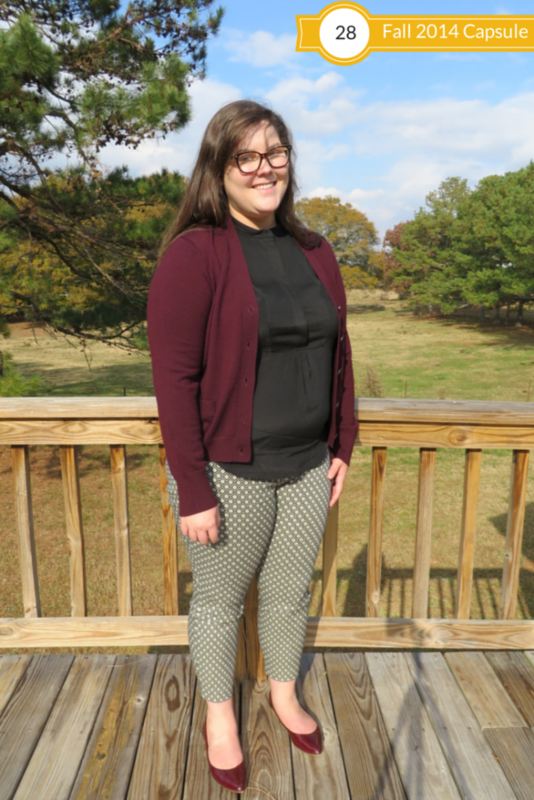 Outfit 21:: (top::cardigan::pants::shoes) This top is one that I purchased mid-capsule and decided to add it. I know the “rules” of a capsule are no shopping during it, but I’m not going to restrict myself like that. What I have been doing is if I add something, I take an item out and it has to be sold. No excuses of packing it away. Outfit 22:: (scarf::vest::top::pants::similar flats) So… there are a few too many patterns going on here if we’re going to be realistic about this BUT I do love the scarf and gingham together. My black booties might have worked better in this situation, but it was a weirdly warm day– again. 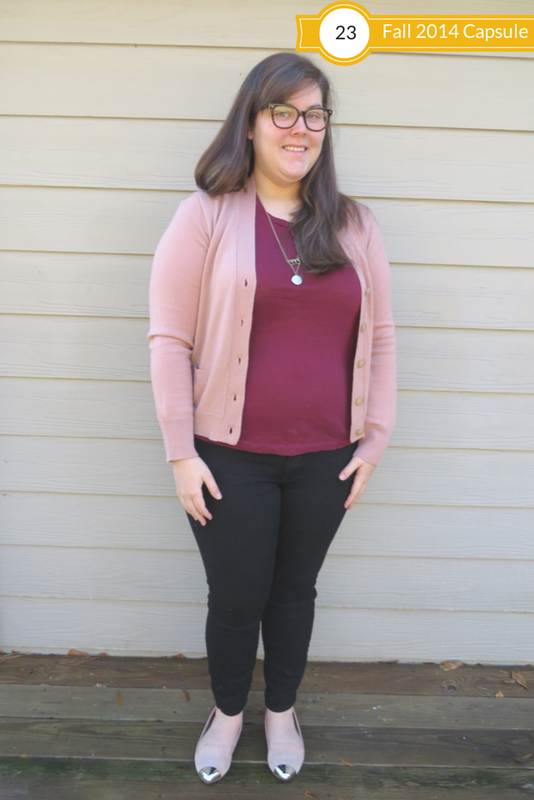 Outfit 23:: (tee::cardigan::jeans::flats) Simple and casual is how I would describe this. In fact I’ve worn it twice since I have been in capsule. 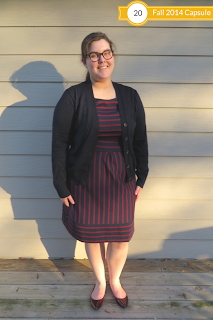 This is my least favorite picture, but has most of the elements to make it my favorite outfit. I love these jeans, the tee, and the cardigan. 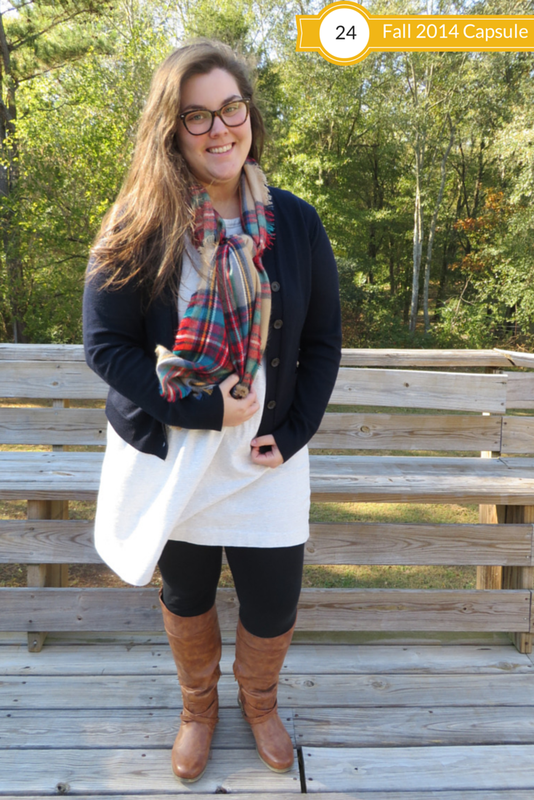 Outfit 24:: (scarf::dress::cardigan::leggings::similar boots) Told you I LOVE this dress. 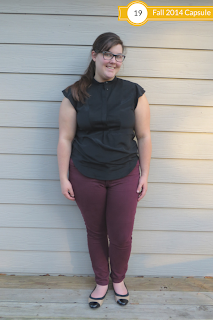 I apologize for the scenery change in the picture, but this particular outfit will be featured later on a collaboration post at Life Could Be a Dream, so you’ll just have to keep an eye out for it there! Out of these, which one is your favorite?